On any given day, there are often more than 100 news articles focused on cancer, many of which speak to new and promising studies or breakthroughs in a research lab. The desperation for better treatment options is palpable. And it is no wonder, since one in three people will be diagnosed with cancer in their lifetime. While cancer research and treatments have made great strides, cancer is still far too common, which raises the question: What is missing? Traditional cancer treatments such as chemotherapy, radiation and immunotherapy have grown by leaps and bounds, but they each have their limitations. Chemotherapy can be very effective and is still the standard of care, but it shuts down the immune system in the process and recurrence is often likely, among many other concerns. Most types of radiation cannot reach all parts of the body, and therefore cannot be used for cancers that have spread. Finally, the medical community is increasingly hopeful about advances made in immunotherapy, but it is still only 20 to 30 percent effective in some cancers, and completely ineffective in others. There is another type of cancer treatment, however, known as cell metabolic therapy, which has been researched and discussed for decades without producing viable treatment options. Cell metabolic therapy targets the mitochondria—energy producers—of cancer cells, shutting down their growth and preventing them from spreading. If we remove the energy source that these cells use to power their attack on the body, we can stop the disease dead in its tracks. There are many reasons why cell metabolic therapy has failed in previous decades, but recent data are demonstrating that it is finally turning a corner. The mitochondria regulate the metabolism of most cells in the body, giving them energy they need to perform. In the last decade, our understanding of the role that mitochondria play in cancer growth has developed exponentially. Scientists used to think that mitochondria were dispensable because they did not seem to be active in tumor cells. However, we now understand that the opposite is true. Cellular metabolism is the set of chemical reactions that occur in living organisms in order to maintain life, involving a complex sequence of controlled biochemical reactions known as metabolic pathways. Back in the 1920s, Otto Warburg observed that thin slices of tumors consume more glucose than normal cells and convert most of the glucose to lactic acid. This “Warburg effect” is the foundation of one of the earliest concepts of cancer, which holds that at the root of tumor formation and growth is a fundamental disturbance of cellular metabolic activity. Today, we understand that the metabolic transformation from a healthy cell to a cancer cell involves mitochondria, not only for generating energy but also to produce biosynthetic intermediates, the building blocks used to support new cell growth and proliferation. Therefore, by targeting the mitochondria of cancerous cells, we can diminish their ability to grow—hitting cancer where it hurts the most. Developing a treatment that can do this effectively is not so simple, however. 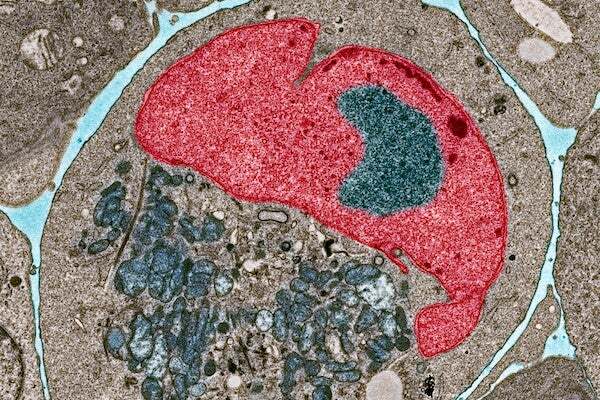 While many labs have tried to create therapies that target cancer-cell mitochondria, most have failed. Often, the challenge has been selectively targeting the mitochondria of cancer cells while sparing those of healthy cells. Another challenge is that cancer cells quickly find ways to get around the therapy-induced suppression of metabolic pathways. For decades, the field of cancer cell metabolic therapy has remained a deserted island. But all of that is changing. In fact, we are seeing a renewed interest with researchers exploring the metabolic emergence of cancer cells to facilitate the discovery and development of new therapies. Metformin and hydroxychloroquine, for example, are two widely used FDA-approved drugs that have been repurposed as anti-cancer drugs, for cancer therapy. Metformin typically is used as a first-line agent for diabetes treatment. Its anti-cancer effect is due in part to the way it diminishes mitochondrial metabolic functions. Currently, there are multiple trials using metformin, including a large phase III clinical trial in breast cancer. Hydroxychloroquine is an anti-malaria drug. Studies have shown that hydroxychloroquine can decrease tumor growth by cutting off the fuels that promote mitochondrial function. There are multiple phase I and II trials testing the efficacy of hydroxychloroquine. There are also newer drugs, developed in the past decade that diminish mitochondrial function. One example is devimistat, a clinical-stage drug that is being evaluated in phase I, II and III trials. In a phase I trial, devimistat used in combination with a chemotherapy regimen known as FOLFIRINOX increased survival in pancreatic cancer patients. Devimistat inhibits enzymes in the mitochondria, thus preventing mitochondria from producing macromolecules for growth. Another clinical-stage drug is CB-839, which inhibits an enzyme that provides fuel to mitochondria. CB-839 is in phase I and II clinical trials. Cancer metabolism is becoming an exciting and promising area for the development of drugs to treat the disease, especially with promising recent research showing that cell metabolic therapy can selectively target the mitochondria of cancer cells. By better understanding cancer-specific metabolic processes, researchers can find new drugs to revolutionize cancer treatment and explore this new alternative to traditional treatments. Targeting cancer metabolism represents an opportunity to develop novel, selective and broadly applicable drugs to treat a multiplicity of cancer types. An exciting area that is being explored is how metabolic therapy might enhance the efficacy of existing therapies including immunotherapy. Within the next decade, the field of therapy targeting cancer metabolism may join the mainstream cancer treatments.